I love Tiramisu! Just about everyone in my family loves Tiramisu! And I'm sure most of you love it just as much as I do. 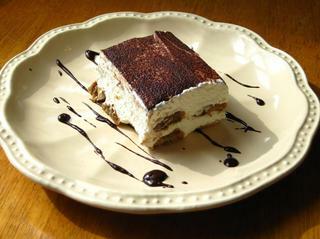 I've tried Tiramisu in a number of restaurants, but none of them made me happy. Even the famous Tiramisu from Olive Garden didn't do it for me. There was only one thing left for me to do. I decided I would go on a quest for the perfect Tiramisu! This is not a new stunt for me. I've been known to go on ridiculous quests for the perfect New England Clam Chowder, the best Blueberry Muffins, the perfect Strawberry Cheesecake, the perfect hot weiners and on and on and on! So, with a list in my hand, I was off to the supermarket...many, many times! Not only did I waste a lot of time practicing and more money on ingredients, but I was getting mighty discouraged and almost sick at the thought of another bite of Tiramisu! I think my family was getting tired of all my crazy experiments as well. But I couldn't quit! The problem as I see it now, was that every recipe I came across was made with marscapone cheese, espresso and homemade sponge cake. I didn't want to go through all that trouble. I wanted to make a "Lazy Tiramisu" that tasted delicious! That's when I came up with this recipe for what I believe is the best Tiramisu I've ever made. 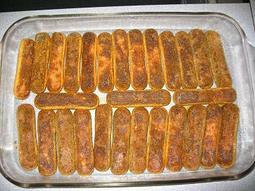 Quick, easy and less expensive! You can make it with Kahlua, Amaretto or both for Toasted Almond Tiramisu. Or, you can make it with all instant coffee and water for a non-alcoholic Tiramisu. And, if you can't drink regular coffee you can substitute decaf! 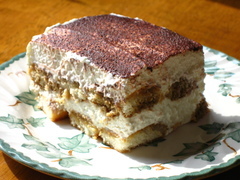 Here is the link for my Easy Kahlua Tiramisu Recipe. You can find it at Suite101.com along with some tasty variations. Try it, I think you'll like it too. We do! Try experimenting a little with Bailey's Irish Cream for St. Patrick's Day!